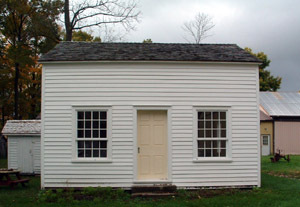 The restoration of the 1813-16 farm house is completed. Enjoy the photos below that show the interior renovation and the final furnishing. 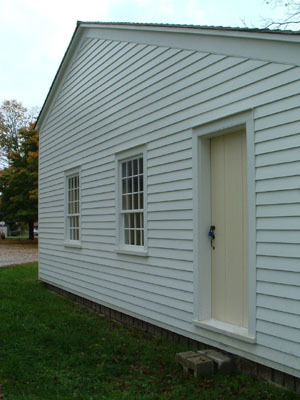 The front door and front widows (east) are shown. 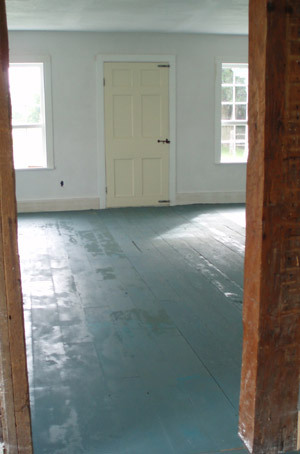 The darker floor boards are original to the house and the new boards will be painted to match the original ones. 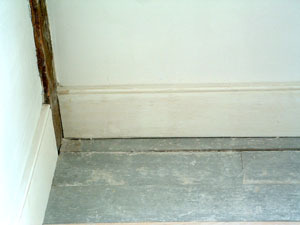 This shows the original baseboard and an exposed timber in the corner of the wall. 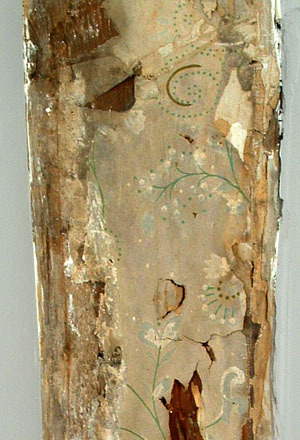 This exposed timber in the south west corner still has some of the wall paper showing on the beam. Another layer is under it along with a newspaper layer. 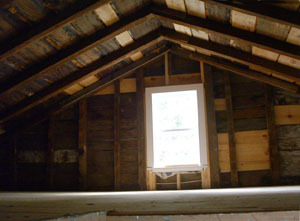 The attic shows the roof boards and the single window. 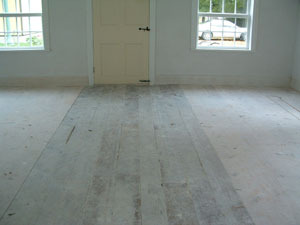 The dark boards are original to the house. A ladder and trap door lead to the space. The north face of the house. The door leads to an entry with a bedroom straight ahead and the main room to the left. 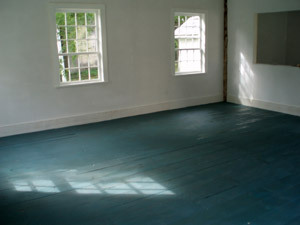 Floor of Lossing house with Quaker blue milk paint and one coat of hemp oil. Entry is from the side door in the bedroom area. The black and white photo is one of the earliest photos of the Lossing House. It shows the original house attached on the left side of the farm house. Shown in the photo is the family of Joseph H. Clayton. Downstairs bedroom with rope bed and cradle. The gala opening of the refurbished Lossing House was held on Friday, May 25, 2007. Click on the photo of the house to see other images of the event.